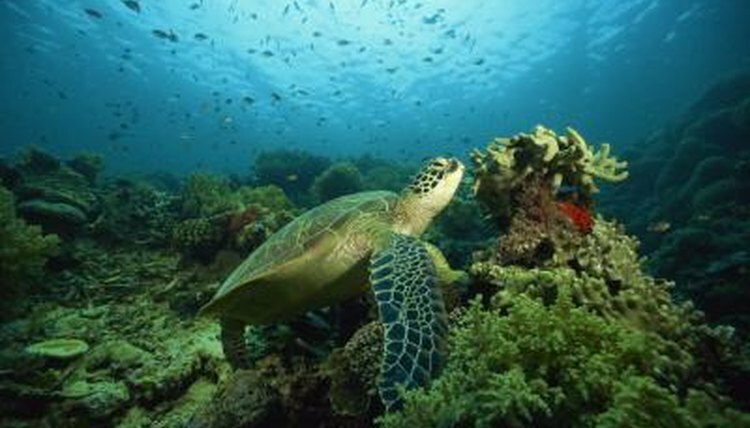 Of the seven sea turtle species, the IUCN lists three as critically endangered and three as endangered or vulnerable. Hunting, habitat loss and other human factors cause declines in sea turtle populations. These creatures are highly sensitive to the effects of climate change. Increases in ocean and atmospheric temperature alter their migratory patterns and increase hatchling mortality. Further, because hatchlings' genders are determined by the temperature at which their eggs incubate, higher sand temperatures result in fewer male offspring, putting sea turtles' reproductive ability at risk. The IUCN lists Kemp's ridley turtles (Lepidochelys kempii) as critically endangered. The species has the dubious distinction of being the most endangered of all sea turtle species. The estimated population of only 1,000 nesting females lay their eggs exclusively on a Gulf of Mexico beach declared a national preserve in the 1970s. Rising sea and sand temperatures decrease hatchlings' survival rates, while rising water levels threaten to submerge their critical nesting grounds. Leatherback turtles (Dermochelys coriacea) have been considered critically endangered due to a combination of poaching and their propensity for getting accidentally caught in fishing nets. Climate change threatens their survival further because of increased temperatures and lower humidity at their Costa Rican nesting grounds. A warmer and drier climate reduces the chances their hatchlings will survive. If the trend continues as projected, scientists predict the mortality rate of leatherback turtle hatchlings could increase by between 50 percent and 60 percent. Adult leatherback turtles face additional risk, as warming oceans have decreased the number of jellyfish -- their primary food source -- within their geographic range. Although poaching is considered the major threat for hawksbill turtles (Eretmochelys imbricata), these critically endangered sea turtles face a significant threat due to climate change. Hawksbills nest near coral reefs, and rising ocean temperatures can lead to an increase in coral disease and other coral bleaching events that cause the corals to die. The loss of coral reefs not only endangers hawksbill turtles' nesting grounds but also results in a reduced food supply for adults. Over the past century, hawksbill turtle populations have decreased by at least 80 percent. The biggest threat for green turtles (Chelonia mydas) comes from hunting for meat. Despite international treaty protection, as many as 100,000 of these turtles are killed each year in the waters off India, Southeast Asia and the islands of the South Pacific. Highly migratory loggerhead turtles (Caretta caretta) are most vulnerable to accidental capture in fishing nets and long lines. The IUCN classifies both of these sea turtle species as endangered. Olive ridley turtles (Lepidochelys olivacea) also are over-hunted and considered vulnerable as a result. Not much is known about flatback turtles (Natator depressus), which were just elevated to full species status in 1988. Previously considered a subspecies of green turtles, these creatures live and nest in a small geographic range off the coast of Australia.